Melt butter in a saucepan over medium heat. Stir in brown sugar, balsamic vinegar and pine nuts. Slice pear into eight slices and add to butter/brown sugar mixture and 'scoot' around until pear is soft (about 5 minutes.) 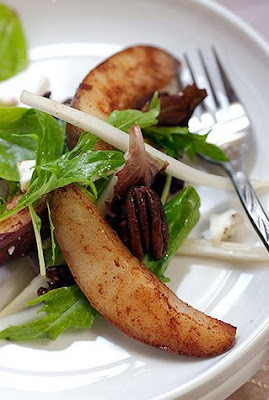 Place arugula onto plates. Top with pear slices and pan juices. Sprinkle blue cheese crumbles on top.